The suggestions offered here are simple reminders, intended to help all of us to develop habits that make our common worship full, rich, and prayerful. It’s about respecting the sanctity of God’s house and the Mass, and about being considerate to others. Of course there may be times when we arrive late, or forget to silence our cell phones. Accidents happen. Etiquette is more about habits, not the rare slip or unavoidable occurrence. Remember when you come to Mass you are entering the house of the Lord and should be dressed appropriately. Try to be on time for Mass. Sometimes things can’t be helped; without doubt cars break down, babies need changing, and alarm clocks fail to go off. Turn off your electronic devices as they can be a distraction to others. When you enter church, bless yourself with the holy water and thank God for the grace given to you at baptism. When you reach your pew, genuflect toward the Tabernacle in the Sanctuary before sitting down and again when leaving the Church. If one cannot genuflect, then a bow is sufficient. Participate in the Mass by singing, speaking, praying and attending within the heart and mind. We are not here to observe. We are all an important part of the celebration. No food or drink in the church with the exception of milk for infants and water for those who are ill. Chewing gum, candy, or cookies should not be allowed. Fast before Mass as this is a component of Communion, it is Church law that everyone must abstain from food or drink for at least one hour before receiving Holy Communion. The exceptions are medicine and water or unless someone is ill and needs to eat sooner, or those who are advanced in age. Bow before receiving the Precious Body. If we are receiving in our hands they should be clasped in front of us in a respectful manner and held chest high. Communion should never be ”taken”, “plucked” or “grabbed from the Priest, Deacon or Eucharistic Minister and should be placed in your mouth before turning away from the altar. Stay until the end of Mass. The Mass is truly not over until the priest has left the altar and after the closing hymn. Help prepare the Church for the next Mass, by placing the books back in their holders and making sure that trash and tissues are picked up, etc. 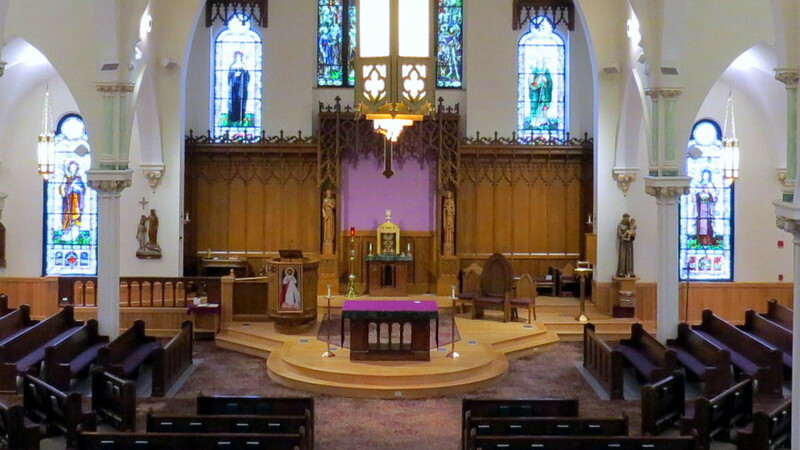 The Church will look sacred, holy and welcoming when things are placed where they belong. In order to keep our church clean, beautiful, and inviting, please refrain from bringing food or drinks into the Church. This includes Cheerios, raisins, candy, gum, etc. For all those who come for Mass, it is necessary that we all do our part. During cold and flu season, there is no requirement for a hand-shake at the ‘Sign of Peace’ if a parishioner is uncomfortable with that greeting. Please respect the right of parishioners to offer a verbal greeting of peace by turning toward those near them without shaking hands. If a hand is not extended, that should be indication enough that a hand-shake would not be welcome. Extraordinary Ministers of Holy Communion have been instructed to wash their hands carefully before Mass and to use the alcohol-based hand sanitizer provided for them immediately prior to distribution of Holy Communion. Please be attentive to the advice of health professionals and protect yourself and others by frequent hand-washing and reception of the flu shots as they become available to you. The byword is caution, not panic!